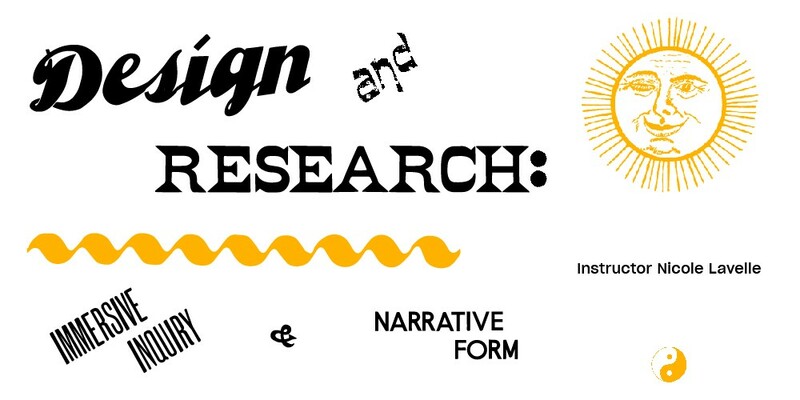 New Summer Class: Design and Research with Nicole Lavelle! It’s time for the summer schedule! We are so excited to have alumni Nicole Lavelle coming back to teach a 299/399 Design Inquiry and Narrative course this summer! Also, this class can count for your 470 requirement as well! This course frames design practice as a site for the interdisciplinary assembly of experimental narratives. In this course, students will be guided through self-directed research projects. Students will be encouraged to follow intuition down emergent paths of inquiry. Students will produce their own tangible research tools and develop visual concept frameworks to guide their projects. Students will create lo-fi print publications and ephemera rooted in copy-shop default production, and the final project for the course will be a public slide-show presentation of each student’s research findings and open questions, presented to an invited audience of classmates and guests. Collaborations are encouraged. There will be off-campus field trips, writing exercises, guest speakers, and readings about research, self-powered inquiry, and narrative. Nicole Lavelle lives in California. She works with people, place, paper, language, and landscape. She works as an artist and a graphic designer. She collaborates as Multi Studio and PLACE TALKS. She is an Affiliate Artist at the Headlands Center for the Arts, an Artist in Residence at the Prelinger Library, and a freelance visual designer for IDEO and Dropbox in San Francisco.